The Best Episodes of Free! #2 - The Eternal Summer of Beginnings! 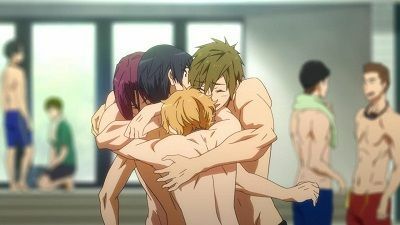 Upon returning from Australia, Haruka gives his thanks to Rin and rejoins his teammates, deciding that he will start focusing on times and winning for the sake of reaching his new dream to swim in the wide open world. He then apologises to Makoto, who explains he is going to a Tokyo university in order to become a swimming teacher. 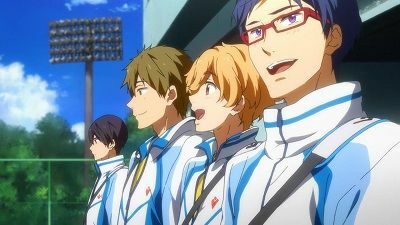 On the night before the national tournament, the group reminisce about the past two years together, with Nagisa and Rei becoming emotional about Haruka and Makoto's impending graduation, though Haruka assures them will always be connected. Following a memorable experience at the nationals, in which Iwatobi manage to win, it is graduation time. Rin passes on the position of Samezuka's captain to Nitori, before telling Sousuke that he'll wait until he returns to the world of swimming. Meanwhile, Iwatobi bury a time capsule containing the sights they saw at the nationals, before joining Rin in a petal-filled pool. Everyone soon goes their separate ways, with Haruka and Rin soon facing off against each other in the professional circuit. #3 - A Swim-Off in a Foreign Land! Upon arriving in Australia, Rin takes Haruka to the beach, where he talks about his experiences in the country before taking him to meet his homestay parents, Russell and Lori. Upon checking into their hotel, the pair find they have to share a double bed for the night, though they manage to get through the night reminiscing about their time together. The next day, Rin takes Haruka to Sydney's Aquatic Center to swim alongside Australia's national swim team, reigniting Haruka's passion for swimming. As Rin states he came to Australia to approach his old coach about joining his team, Haruka states he has also found a dream to aim for. #4 - The Six-Beat Kick of Tears! 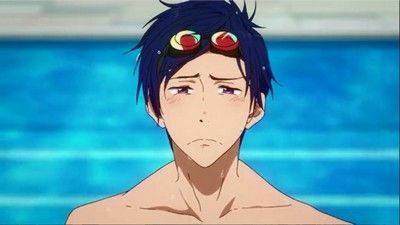 After being informed by Nitori, Rin becomes aware of Sousuke's shoulder injury, learning that he had been harboring for two years and that all his talk of being scouted was a lie. #5 - The Locomotive of a Twist! Makoto starts helping Goro at the Swimming Club, acting as a coach teaching children to swim. Meanwhile, Sousuke decides to help coach Nitori to improve his swimming. 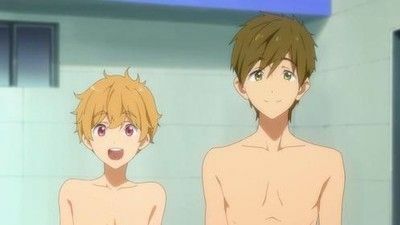 As Makoto notices one of his students, Hayato, struggling with swimming without a kickboard, he discovers his brother is Kisumi Shinigo, an old classmate from his and Haruka's middle school. As the two reminisce, Kisumi explains to Makoto how Hayato developed a fear of swimming after he nearly drowned after falling off a boat. Told by Haruka to think over his own experiences of learning to swim, Makoto teaches Hayato how to do a backstroke, helping him to overcome his fear. As Makoto's time as a coach comes to an end, he and Haruka learn from Kisumi that Sousuke had recently obtained an injury to his shoulder and had been competing in tournaments in spite of it. #6 - Metamorphosis of the Soul! Ikuya and Haruka face off in the Individual Medley, mending their middle school rift. Hiyori and Ikuya also make amends, swimming the relay as Shimogami U. teammates against Haruka's Hidaka U. team. Afterwards, Natsuya reunites with Ikuya and apologizes to Hiyori while Hiyori, free to be himself, is comfortable seeing Ikuya spend time with his middle school friends once more. #7 - The Forming of a Slump! On the day before the regionals, both Iwatobi and Samezuka end up staying at the same hotel. While Nitori is chosen to swim in Samezuka's relay team thanks to his training, Haruka, who is in deep thought about being scouted, ends up sharing an elevator ride with Sousuke, confirming his shoulder injury. The next day, as Rin manages to pass his heat in the 100m freestyle, Haruka becomes overwhelmed by the pressure of performing in front of scouts and ends up stopping dead in his tracks. When Rin confronts him following the race, Haruka snaps at him, feeling that stuff like dreams and his future are being forced upon him. 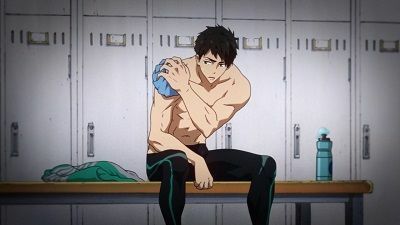 As Haru tries to assure his friends he will swim in the relay with them, Sousuke continues to experience more pain from his shoulder injury. #8 - Revenge in the Medley! Haruka, Makoto, Nagisa, and Rei swim in their individual events. Rin becomes irritated as he remembers watching them swim back in grade school. Afterwards, the four Iwatobi Swim Club members must prepare for the medley relay. #9 - Memories in the Distance! After the match, Haruka and co. are once again reprimanded for trespassing the Samesuka grounds. Makoto and Nagisa run into Gō and all agree that Rin's attitude had dramatically changed in the past few years; simultaneously learning that Gō had been the one who sent him to the Iwatobi Swimming Club while Nagisa suggests that they form a school swimming club. After getting Haruka on board, Makoto and Nagisa propose the idea to their home room teacher, Miho Amakata who agrees after they give her a little prompt. Finally, the club is accepted by the faculty on the condition that they find one more member, and restore the school's swimming pool themselves. Nagisa begins the task of finding a fourth club member, which proves much more demanding than they had initially thought. 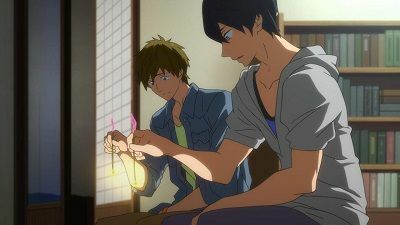 While continuing the restoration, Gō still confused about Rin's behavior asks Makoto about their race and learns that Haruka threw the match, allowing Rin to win since he was merely content with being in the water, something which angered Rin. 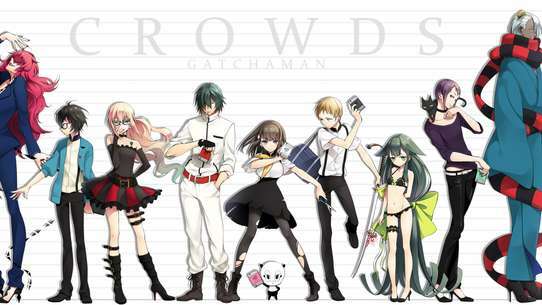 Believing that they can revert Rin to his old self, Gō volunteers to join the club as their manager. Later, Makoto pays one final visit to the Iwatobi Swimming Club and runs into their old mentor, Coach Sasabe. Sasabe reveals that Haruka and Rin had a race when the latter made a rare return to Japan, of which Haruka easily won. 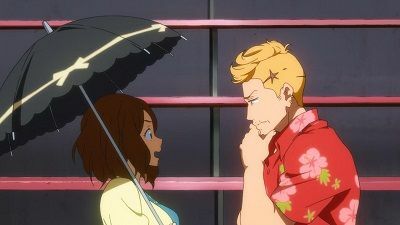 Rin was exceptionally disappointed that his hard work was for naught, creating a rift between them, subsequently causing Haruka to quit competitive swimming because he had hurt Rin's pride. Upon learning this, Makoto calls Rin to inform them of their plans while Rin decides to join the Samesuka swim team for his own grudge against Haruka. Finally, Miho and the group officially establish the Iwatobi High Swimming Club and Haruka can't help but christen the pool with the first swim much to his friends' dismay. #10 - The Shock of Not Breathing! Haruka and Nagisa awaken to Makoto's shouts for Rei and immediately dive to their aid after noticing them in the rough sea. Upon approaching Rei, Makoto suddenly becomes fear stricken but is rescued by Haruka. However as Nagisa goes after Rei the group is suddenly struck by a large wave. A while later, Haruka drags Makoto to the nearby Sukishima shore and upon awakening, the latter's old fear of the ocean resurfaces. Elsewhere, Nagisa and Rei make it to shore with the latter blaming himself for putting the group in danger. Soon enough, the guys reunite and despite each blaming themselves for their own shortcomings, are genuinely relieved that they are all unharmed. With the storm still raging on, the guys decide to head over to the nearby abandoned Sukishima Rest House for shelter and after scavenging some leftover food from the kitchen, they decide to pass the time by telling each other embarrassing stories. Eventually Rei asks Makoto about the reason for his hesitation in the water and much to Haruka's objection, Makoto reveals his thalassophobia. Makoto explains that when he was younger, he had befriended an old fisherman in a nearby fishing harbor. However the man's boat soon got caught up in a typhoon and sank three kilometers from the harbor, killing everyone on board. Makoto explains that both himself and Haruka used to swim three kilometers offshore everyday, but ever since the fisherman's death, he felt as if an unknown force dwelt in the ocean. Makoto concludes that he planned their trip despite his fear since believing that their shared passion for swimming can take them anywhere. As the storm finally subsides, the guys step out and marvel at the stars, which symbolically reflect off of a large puddle, echoing Makoto's words. The next morning, the guys swim back to the mainland and collapse from exhaustion on the shore, much to Gō and Miho's confusion. #11 - Dive to the Future! The All-Japan Invitational hosts swimmers hoping to qualify for global competition. The character of Kinjou Kaede appears for the first time. The Kirishima brothers race together and find peace. Rin qualifies in the 100m butterfly while Haruka loses his first heat. Afterwards, Rin, Haru and Makoto share their personal goals in a private moment. The following day, Haru's last heat takes place with the outcome unstated. #12 - One Style Final! As the Prefectural Tournament draws closer, the Iwatobi High Swim Club starts improving their swim times. Elsewhere, Rin awakens in a frenzied state after having a nightmare involving Haruka and his younger father. Afterwards at training, Aiichiro Nitori grows upset that Rin would limit himself to the freestyle event when he possesses far greater potential. 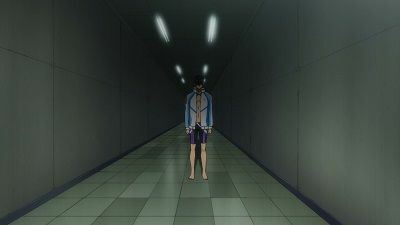 While Aiichiro helps Rin train that night, the former laments his inability to participate in the 100m event, but Rin assures him that his endurance is better suited for the 400m race. 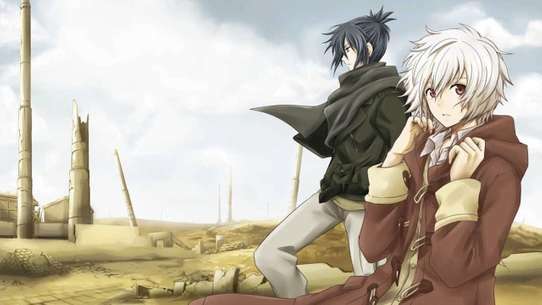 Afterwards, Rin reveals to him the story of his late father. Rin explains that his father was the best athlete in the past Iwatobi Swim Club and aspired to become an Olympic swimmer. However his dream was never realized after he settled down to married life as a fisherman and was hence killed when a typhoon struck his boat late one summer. Following his father's death, Rin adopted his dream, but explains that Haruka is the only thing standing in his way of moving forward as an athlete, since he lost to Haruka despite all his training in addition to their differing reasons for swimming. Finally on the day of the tournament, Gō reveals that both Haruka and Rin are competing in the fourth freestyle heat and are in neighboring lanes due to having similar qualifying times as explained by Makoto. As Haruka leaves to get ready he encounters Rin at the lockers where their rivalry continues. Finally as the race begins, Rin immediately starts pulling ahead of Haruka in the first leg. Haruka starts catching up as they make the turn into the second leg and they both seem to be neck and neck towards the finish. However much to his friends' shock, Haruka places second with Rin being the victor and advances to the next round. As Rin exits the pool, he declares that his win means that he will never swim with Haruka again, leaving the latter in utter shock. #14 - Hesitant Loosen Up! Prefecturals are over and the Iwatobi Swim Club members are pleased by the progress they have made. A local summer festival gives them an opportunity to relax. When Nagisa finds out that Rin is also at the festival, he orders Rei to follow Rin and make sure that Haruka and Rin do not meet. The Swim Club officially starts training in the refurbished pool using an old training regiment of Rin's Gō had unearthed. Rei's inherent academic skills at learning all the swimming theory prove to be useless since his body refuses to move in the water. Elsewhere, Rin grudgingly realizes that his victory against Haruka was due to Haruka's lack of physical training and not his actual talent. Nagisa and Makoto start teaching Rei how to swim and learn that while he can float, his problem still eludes them. The following day, the guys try to come up with designs for a club uniform but Gō instead gives Rei's lessons higher priority and makes a revamped swimming regiment during which he must master swimming in one week before their first prefectural tournament. 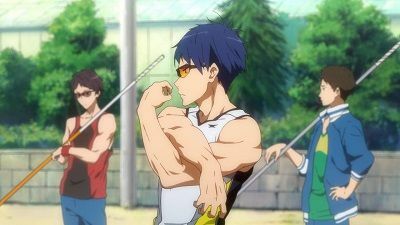 Nagisa and Makoto try and fail to teach Rei their signature techniques; the breaststroke and backstroke respectively causing Rei to blame his inability on their teaching methods. Makoto suggests they ask Sasabe for help but he bluntly refuses. During the weekend, Rei attributes his inability to not having proper gear, hence prompting a visit by the team to a sports store to buy swimming essentials. 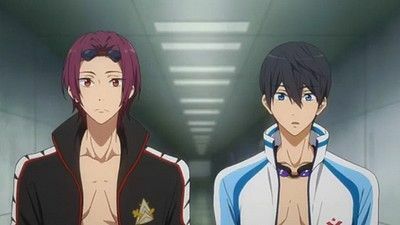 At the store, Haruka and Rin run into each other and have a short discussion about their differing forms with Rin wanting a race with them both in peak condition, or else he may no be able to move forward from his loss and both decide to settle the score at the upcoming tournament. Afterwards, Haruka takes a turn trying to teach Rei freestyle swimming and fails, greatly disappointing Rei. 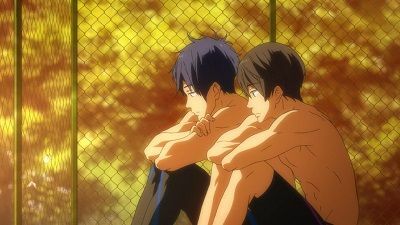 As the day draws to a close, Haruka laments to Rei that he too isn't compatible with other techniques in that he doesn't swim freestyle by choice; merely because it is all he can swim. 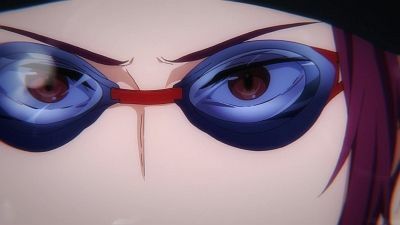 The next day, having come to this realization, Rei tries the last technique and finds it compatible with himself: the butterfly stroke. #16 - The Butterfly of Farewell! #17 - Trial in Open Water! Believing that the added pressure will help the Swim Club in their training, Gō continues to make her countdown calender for the upcoming prefectural tournament. 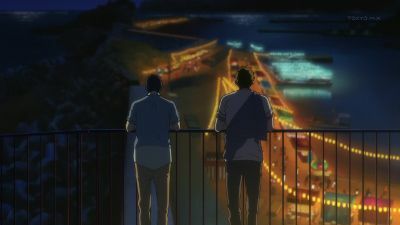 Meanwhile, as the guys decide on which events they will each participate in at the tournament, Gō discovers a decades old training regiment of the past Iwatobi Swim Club and excitedly proposes that they use it and venture to an island for a summer training camp. Afterwards, the club tries and fails to get Miho to sponsor the trip. Makoto proposes using camping equipment to stay outdoors while resorting to bribing Goro to use his squid fishing boat to take them to the island and back. Later, Haruka expresses concern for Makoto since he had a rather scarring experience with the ocean in the past, to which Makoto reassures that he is fine. On the day of the trip, Sasabe takes the Swim Club to the island where they coincidentally discover the Samezuka Swim Team along with Rin, training at a special swimming facility on the island. After the guys get settled on the beach they begin their stamina training regiment which involves making three long-distance swimming circuits between the deserted islands of Sukishima, Oshima and Mizushima. At the end of the first day, the club only manages swimming half of their goal leaving Rei to feel a bit disappointed for lagging behind. As they prepare for dinner, Gō heads to a nearby convenience store and briefly runs into Rin who shows some concern for Makoto after Gō explains their training, before returning to his usual stoic self. That night, unable to sleep due to his performance, Rei heads into the ocean to continue training when a sudden storm takes him by surprise. Makoto awakens at that moment and goes looking for Rei; frantically diving to his aid upon hearing Rei's cries for help. #18 - The Open Turn of Destiny! As both Iwatobi and Samezuka continue to train for the nationals, Rei worries about Haruka, who is unable to participate in the freestyle event. Later, Haruka is approached by Sousuke, who tells him to move forward so that Rin can improve alongside him. As Obon arrives, Makoto and the others confront Haruka that he isn't being his usual 'free' self, expressing their desire to help him find a dream. However, Haruka refuses to hear Makoto out, becoming further upset when he reveals he plans to go to a university in Tokyo. 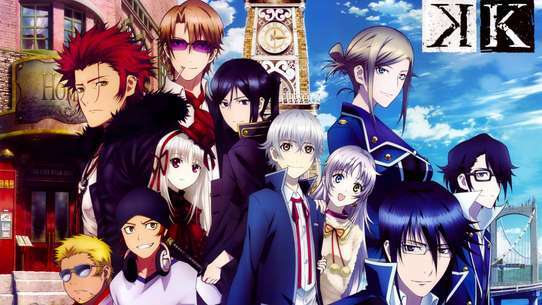 As Haruka starts to seclude himself, he is approached by Rin, who decides to take him with him to Australia. 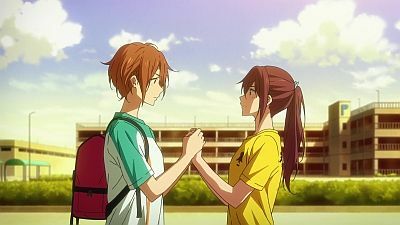 On the day before the prefecturals, Rin and Gou pay their respects to their father, where Rin gives Gou a photo of him to put up in the Swimming Club. The next day, Nagisa, Makoto, Rei, Rin, and Momotarou all qualify in their respective individual events. 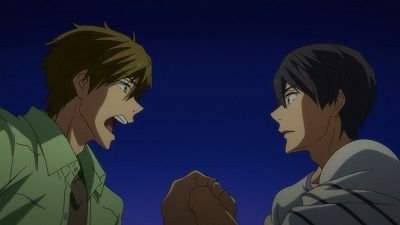 Later, Makoto competes against Haruka in the 200m freestyle, wanting to have a real race against him before he graduates. Despite losing due to his pacing, Makoto feels happy to have been able to have a serious race with Haruka. Haruka and Rin then face off against each other in the 100m freestyle, with Haruka narrowly beating Rin by a split second, bringing the first day's events to a close. #20 - A Resolution's Heads-Up! After the others notice him behaving oddly and insisting on sleeping over, Nagisa reveals he has run away from home, eventually explaining that his parents told him to quit the swim club because of his poor grades. Wanting to avoid his mother, Nagisa and the others hide out at the swimming center to come up with a plan, where Nagisa laments how he doesn't find studying fun, having been forced to do it endlessly during middle school. As the group move further into the school when someone approaches, Rei tries to convince Nagisa to tell his parents how he really feels. Moved by everyone's words, Nagisa vocalises his true feelings to the pursuer, who turns out to be their teacher, Miho Amakata, who came after Haruka told her to let them handle it and gives Nagisa the courage to talk to his parents. In the end, Nagisa's parents allow him to stay in the club on the condition he work hard for the nationals. #21 - Streamline of Unity! Rin and Haruka break from training to attend the high school National tournament, reuniting with old friends. #22 - Theoretical Dolphin Kick! Haruka catches a cold from his swim in the newly restored Iwatobi High swimming pool. The next day, while taking the train to school, Nagisa tries to recruit Rei Ryūgazaki to join the swim club to which he bluntly refuses. Gō proposes that the swim club join an indoor gym so they can practice swimming until summer, but due to its expense, they seek sponsorship from the faculty. Miho admits that they won't get sponsored until their club earns accomplishments in tournaments, but would still require a fourth swimmer. Nagisa informs Haruka and co. of Rei's perfect candidacy due to his feminine given name. This prompts Nagisa to wait for Rei after practice, much to his surprise and continues to pester him about joining. The next evening, while doing pole vault training, Rei's coach admits that his form wouldn't improve unless he stops calculating his movements beforehand, much to his frustration. Gō informs the club that she had successfully scheduled a joint swimming practice with the Samesuka team at their indoor pool, but they would still require a fourth swimmer. The following morning, Nagisa meets up with Rei on his run to school and explains his reasoning for wanting Rei to join prompting Rei agree on a trial basis. At the joint Samesuka-Iwatobi practice, Rin continues to give Haruka and co. the cold shoulder. Rei tries to avoid swimming in the time trials, but is forced to and much to everyone's surprise, it is revealed that he cannot swim. Although he ends up marveling at Haruka's beautiful swimming form, realizing that Haruka swims with passion rather than calculation. The next day at his pole vaulting practice, Rei doesn't use his calculations and falls. He approaches the spectating Haruka and co. and admits that he would like to achieve a form similar to Haruka's and officially joins the swim club while tasking Nagisa with teaching him how to swim. #23 - Irritated Heart Rate! 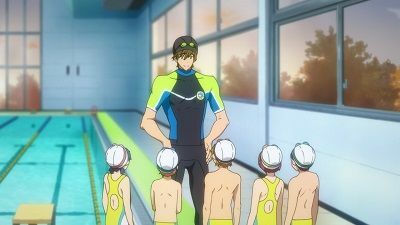 Coach Sasabe begins training the Iwatobi Swim Club for the upcoming tournament. Meanwhile, Rei is unhappy about the fact that he's the only one who doesn't know about what happened with Rin in the past. After Rin expresses his frustration, Haruka decides to tell him about what happened when they were in grade school. #24 - The Stroke of a Chance Encounter! 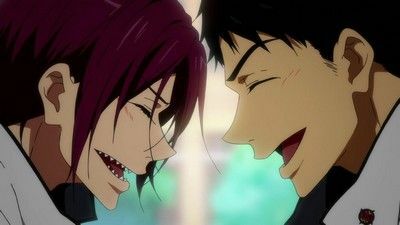 Rin reminisces with Sousuke, his classmate prior to transferring to Iwatobi during elementary school, who decided to spend his last year of high school in his hometown before swimming professionally. Meanwhile, Goro plans to put on a swimming festival for the Iwatobi Swimming Club for children, asking Haruka and the others to spread word and come up with a main event, with Haruka suggesting a relay event. With Rin asked to assemble a team of his own to swim against them, Sousuke asks to join on the condition he run in the freestyle leg. On the day of the event, one of Rin's team members is forced to drop out, but they manage to find the former team captain's brother, Momotarou Mikoshiba, to fill in for him. 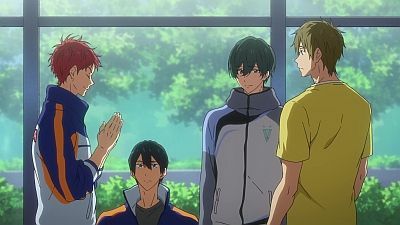 Prior to the relay, Sousuke confronts Haruka, telling him not to get in Rin's way. As the relay gets underway, both teams show strong form with Haruka's team narrowly managing to win. 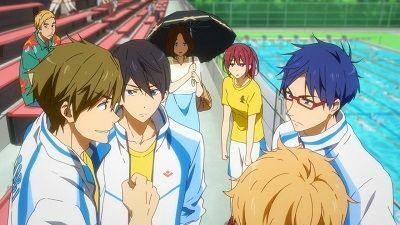 Afterwards, Rin invites Momotarou to join his swim club whilst Haruka becomes cautious of Sousuke's attitude towards him. #25 - Reunion at the Starting Block! Second year high schooler, Haruka Nanase reminisces about his time spent with his friends in their grade school swimming club and of wanting nothing more than to be a freestyle swimmer. In the present, Makoto Tachibana goes to pick Haruka up for their second day of school at Iwatobi High, and while having lunch that day, they encounter their old friend, and recent transfer, Nagisa Hazuki. Nagisa not only wishes to swim with Haruka like they used to, but also suggests that dig up a time capsule containing a relay trophy they had won with their friend Rin Matsuoka at the dilapidated Iwatobi Swimming Club. 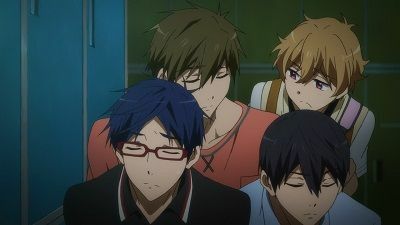 While there, Haruka once again reminisces over a photo of the race, being the last time the group had swam together before Rin had moved to Australia to enroll in a swimming school. Afterwards, the group shockingly runs into a completely changed Rin in the hallways and immediately challenges Haruka to a race, until they discover that the old pool is empty. 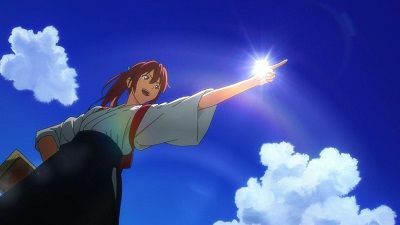 At school the next day, a scarlet-haired girl observes the group with a friend and remarks of them being old acquaintances before Makoto and Nagisa are reprimanded for trespassing at the swimming club. 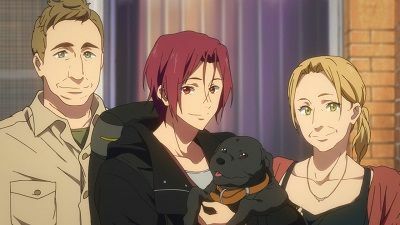 As Makoto and Nagisa visit Haruka that evening, they discover the scarlet-haired girl who turns out to be Rin's sister, Gō Matsuoka attempting to pay Haruka a visit and learn from her that Rin is now attending the Samesuka Academy upon his return from Australia. 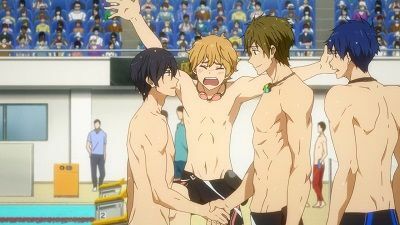 Afterwards, Makoto and Nagisa convince a reluctant Haruka to visit the academy by tempting him to a swim in the school's pool. 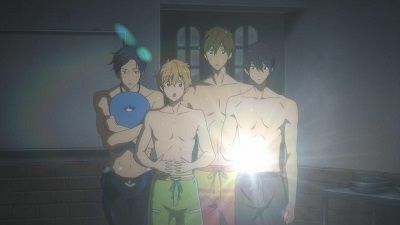 Upon arriving, they wait after hours and break into the academy's swimming pool until they are discovered by Rin who aggressively orders them out. Haruka then steps out of the pool and challenges Rin to a freestyle race.